Last July, I was honored to launch my Month of Authors and Artists interviews with a Q&A from Tara, the model on the cover of Enchanted. This year, I’m thrilled to begin the month by bringing you an interview with Chaeli — the model on the cover of Hero! While the Hero cover has gone through multiple revisions, It’s been a relief to see that Chaeli’s intense stare has been the one thing to stay the same. 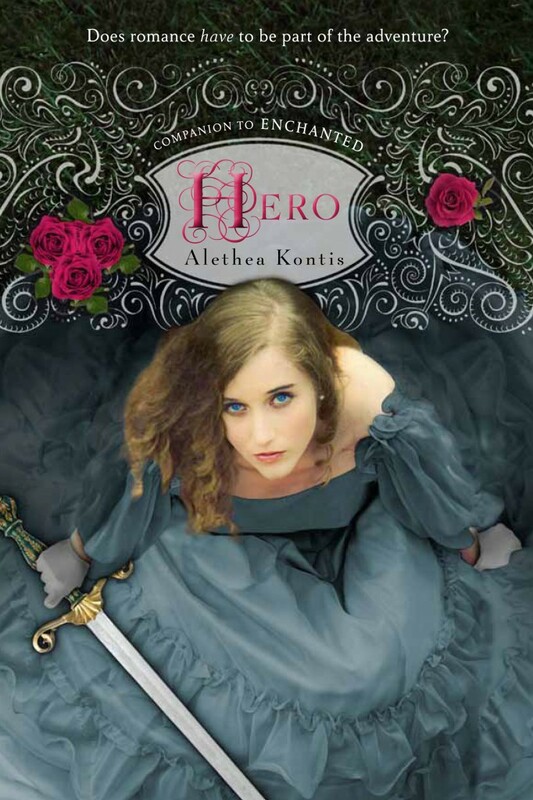 Alethea: When was the picture for the cover of Hero taken? How old were you? 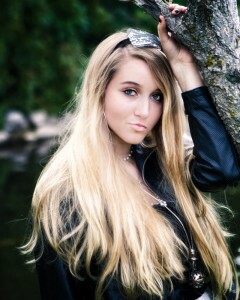 Chaeli: July 2012, I was 16. A: Is that your dress? C: It’s one of my Mom’s costumes. Though I do wish I could keep it for myself! A: How is the photographer related to you? A: Have you done a lot of modeling? A: Are you on the cover of any other books? C: Yes, I’m on the cover of about 20 other books, but Hero is the only one where you can see my face! A: The Hero cover has been through a lot of changes, but the one thing that’s always stayed the same has been YOU. What do you think about the many covers of Hero? C: I like the final cover the best, the colors are very appealing to the eye. A: What kinds of books do you like to read? C: I love teen romance! Especially the Hush Hush series by Becca Fitzpatrick. A: What were you like as a kid? Were you a tomboy? Have you ever held a sword? C: I was a girly girl for the most part, I always liked anything pink and frilly. I never liked playing competitive games. A: What’s your favorite fairy tale? C: Hmm… that’s a tough one! I would probably say “Beauty and the Beast,” because of the deep underlying message of inner beauty! A: Saturday Woodcutter has a HUGE family. Do you have any sisters and brothers? A: Who in your family tells the best stories? A: What are some of your hobbies? A: Where do you see yourself in five years? C: I see myself working in the arts field. I always have loved art and I hope to have a career that involves art! A: What are three things you’d like to do before you die? C: Well… I’d like to skydive, travel the world, and meet all my favorite celebrities! This entry was written by Princess Alethea and posted on July 2, 2013 at 7:00 am and filed under Hero, Interview. Bookmark the permalink. Follow any comments here with the RSS feed for this post. Interesting how different the model looks in each of the photos. What a cool thing later on to be able to say she’s been on a bunch of book covers. I love that you were able to interview your cover model. I’m stopping by from the YA-RWA loop! What a great interview. That’s always nice to get an interview with the cover model. You learn so much. Thank you Alethea for taking the time to interview Chaeli. As her Mom, I can tell you our extended family and friends really were delighted to see the interview. Haha, this is awesome. What a good idea for an interview subject. I’d never even consciously realized that covers sometimes have models.